The strength of the concrete frame combined with the protective Metal-ArmorSM finish on the seat produce a long-lasting, durable bench with simplistic beauty to complement any environment. 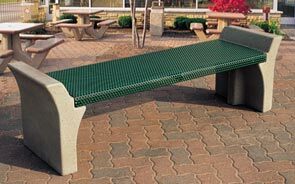 The heavy-duty 11 gauge perforated steel bench seat is coated with Metal ArmorSM a treatment that beautifies the bench while simultaneously protecting it from weathering and harsh solvents. The FDA and USDA approved Metal ArmorSM finishing process provides excellent color, gloss retention, and also prohibits the growth of mold and bacteria. The entire treatment is a single process, environmentally safe procedure that creates a uniformly finished bench seat without the runs and drips of similar type coating processes. 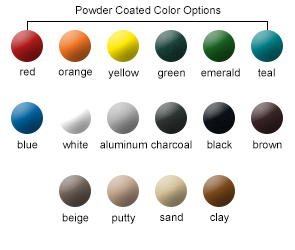 Select the best bench color to suit your needs from one of the several Metal-ArmorSM Color Options as shown below. The robust concrete frames provide a sturdy base and are available in two distinct concrete finishes: Weatherstone or Ground Glass Concrete (qualifies for LEED® points). The Weatherstone Finish comes in nine different colors. The Ground Glass Concrete Finish gives you the opportunity to choose your preferred finish, select your desired matrix, and pick the recycled glass color. With dozens of combinations to choose from, you can determine the perfect blend of design elements to create an exclusive bench for your facility.